Check out these desks through the ages. We have all of these models and more! The Evolution Continues…Which Will You Choose? Students get to fidget with their feet and keep their concentration. A great option for colleges! These desks are designed to fit together in circles, groups, and rows. With plenty of writing surface and complementary chairs that fit snugly for end-of-day cleaning. These are height adjustable, storage friendly, and easy to move around for collaboration pods. It has a full writing surface, attached chair, and book basket. What more could you want? 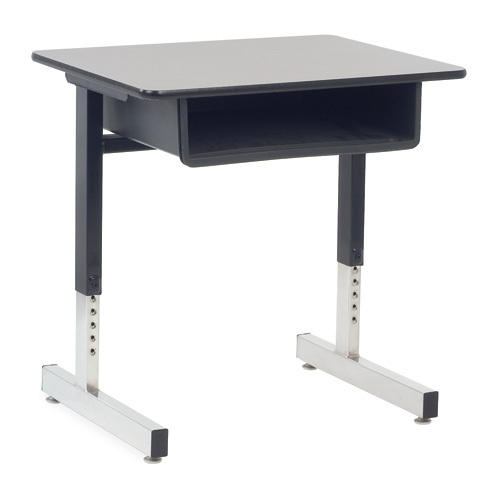 This desk had adjustable legs, an open book holder, and full writing surface. This oldie but goodie is sure to please. Recognize any of these desks from your school days? Let us know in the comments!